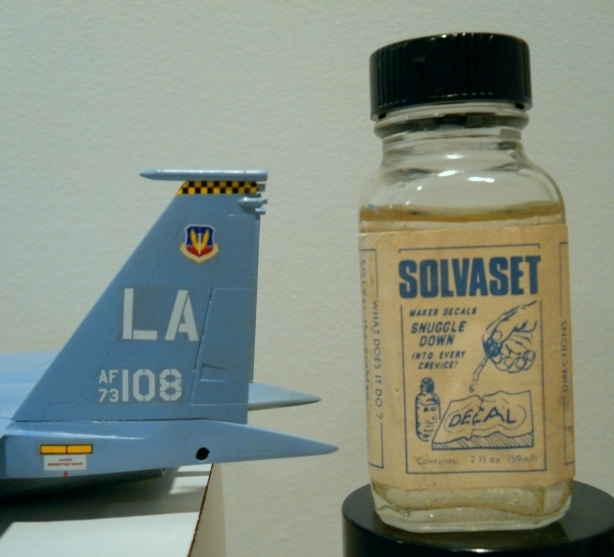 Scale Model Soup: I love Solvaset! Practically every model I build has at least one decal that has to conform over some contorted area, and as I wrote about yesterday, decaling is the one step in the process of building a model where everything can go horribly wrong. I use Microscale's Micro Set and Micro Sol on most builds and those two products alone allow me to lay most decals onto a model with reasonable success, but when I need to apply a decal over a particularly complex shape nothing beats Solvaset. I don't know what's in this witch's brew, but I'm convinced it's not of this world. This stuff is great. The bottle I have has been in my toolbox for more than 25 years! If you don't have a bottle of Solvaset on your workbench you really need to get a bottle, or two. If you're in the United States you can get Solvaset from Sprue Brothers. For my UK readers I'm told Hannants stocks it but I don't see it listed on their web site. Solvaset and a hair dryer will make the most reluctant decal conform! I've built literally hundreds of 1/43 scale car kits (for customers and shops), and could not have been as prolific or successful without Solvaset. Great tip. I've heard of using hot water for decals but never a hair dryer. Will try!